We have a large field on the far end of the school which we would like to make a football field. There is a makeshift one now that the neighborhood children use after school hours. The classroom photo to the right is for grades 1,2,3. There is plenty of space for expanding the school. We will be building another classroom grades 4,5,6.
with swing on the far side. We would like to expand this area with other activity games. and an area to color, write expand the imagination and create designs. white glue, paints and brushes and other art supplies. Please contribute - for a mind is a terrible thing to waste. Baobab School would like to offer a midday lunch program. 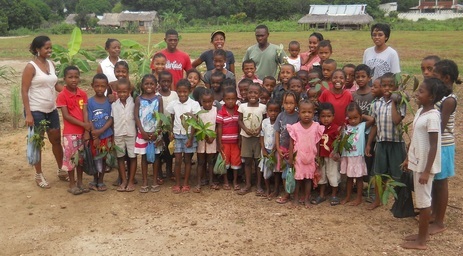 Schools of Madagascar stop from 11:30 till 2:30. Between those hours the students walk home, eat and walk back to School.. With a lunch program I know these students would receive a meal. Some students go home and there is no food. Some students don't come back at 2:30 for they are to tired & weak. Some have not had any breakfast either. Others need to work to make a few pennies to help contribute to the family evening meal. School hours are Mon, Tues, Thurs, 7:30 - 11:30 & 2:30 - 4:30 /Wed, Fri, 7:30-11:30. A Food Program- starting for Mon, Tues, Thurs, which would give us the chance to see all students get at least one daily healthy meal and also have an extra hour of education on those days. There is a man down the well about 24 feet to hand dig deeper for water. Well goes dry in July/Aug/Sept. We wish to have Solar Energy---This will be very important to School Baobab. With this we will be able to have a refrigerator to keep Medical Supplies. Computers & audio and visual equipment to enhance learning skills. Charge mobile phones and lighting for night security. School Garden where we grow fruits and vegetables. 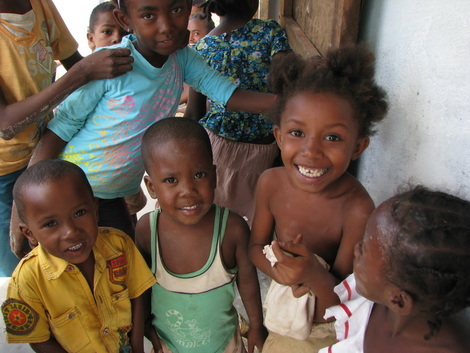 The children of Madagascar are happy people.. Many do not get to go school - ever. Some get to have about five years of education and the few making it through the high school years. There is a great deal of poverty here but the happy and easy going atmosphere hides most of that. Parents struggle to live from day to day, so the few dollars it would take to send their child to school per month can be of reach. The children run free on the streets playing games with a stick, or ball and some help supplement the family income by selling fruit on the street market. Children need an education, they need to strive to fill their inner potential through the academics and the arts. We know that children have a hunger and eagerness to learn , think, create and fulfill their natural born talents. Baobab School offers this opportunity and you can help us help the children with these projects and various programs. Contact us with your support and ideas of how we can make this a better school for all involved.